12.5" RCOS @ ~f/9 (2880 mm fl) at 0.64 arcsec/pixel. Shown at 3.36 and 1.40 arcsec/pixel. 11/6/2013 to 2/20/2014 Chino Valley, AZ... with CCD Commander & CCDSoft, AOL guided. eXcalibrator v4.30 for (g:r) color balancing, using 23 stars from the SDSS-DR9 database. CCDStack to calibrate and register the sub exposures and create the RGB image..
PixInsight processing includes registering and stacking the luminance, gradient repair, non-linear stretching with HistogramTransformation and selective detail enhancement with HDRMultiscaleTransform. 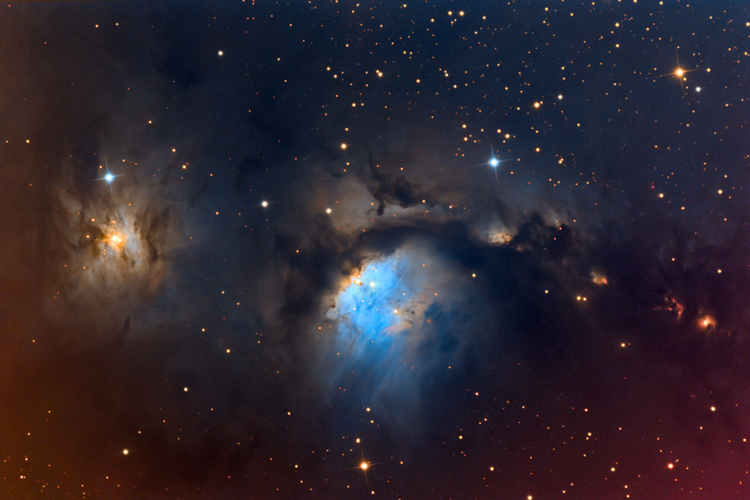 M78 (NGC 2068) is the brightest reflection nebula of a group that also includes NGC 2064, NGC 2067 and NGC 2071. The group is located in the Orion Molecular Cloud Complex that is about 1,600 light years from Earth. M78 was discovered by Pierre Méchain in 1780 and catalogued by Charles Messier in the same year.